the terms used on your typical test strip. On a typical test strip, there is a reading for Total Chlorine and Free Chlorine. Free Chlorine is the chlorine that isn’t combined with anything. It’s free and available as an effective sanitizer. Combined Chlorine is the chlorine that’s bonded or attached to the stuff it worked on. If your water is fighting something, your Free Chlorine will quickly turn to Combined Chlorine and your reading will be low. Combined Chlorine is also known as Chloramines. If you’re experiencing a strong smell of chlorine, it’s likely that it’s the Combined Chlorine or Chloramines you’re smelling. What does that mean?! It means that the chlorine in your tub is “locked” and when that happens it does not sanitize efficiently. You will need to “shock” the water to break apart the chloramines and purify the water. So, to answer the question, if your Total Chlorine is high but Free Chlorine is low, it is an indication that the hot tub requires a shock treatment. This can be done by adding your weekly dose of an oxidizer like Beachcomber CareFree, Mineraluxe Oxygen or Beachcomber Ultra Shock. Oxidizers will destroy chloramines and reduce waste by literally burning it off and will raise your Free Chlorine. When you add an oxidizer, make sure run your jets for 15-20 minutes with your hot tub lid open so that it can gas off. Following the treatment you are free to go in and enjoy! For answers to other commonly asked questions, check out our Water Care FAQ page. 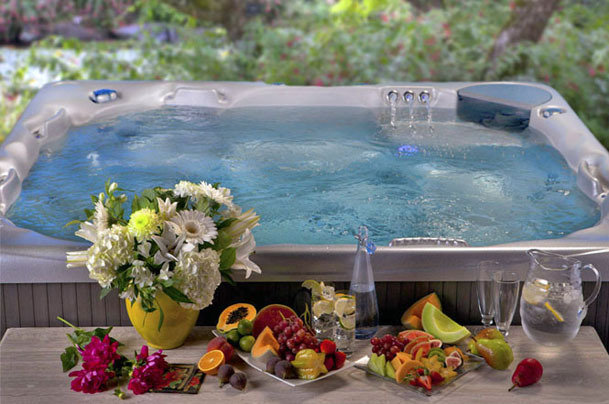 Come in and see your Water Care Specialist at Beachcomber Hot Tubs, Pool & Patio for a FREE water test and details on how to have perfectly balanced water!